Are you looking for a cash loan on some type of collateral and need a pawn shop that is close by to help you out? When most people are looking for a pawn shop these days the first place they go is the internet. They simply Google “Pawn Shop Near Me” or “Pawn Shop Close by” but how do you know if the pawn shop you find is the right one for you? Then Central Mega Pawn is the pawn shop more and more people close by are choosing to get a great deal on a cash loan. 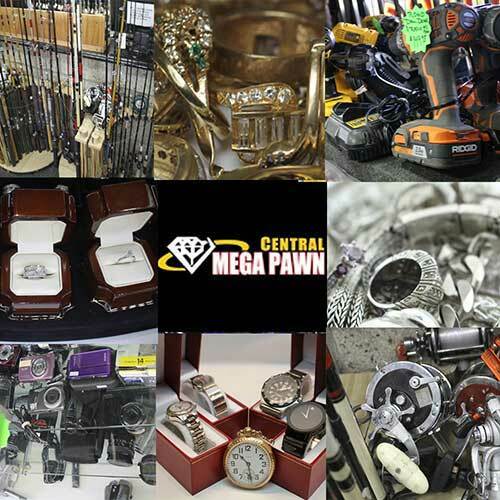 At Central Mega Pawn we will provide a pawn loan to our customers as well as sell and buy just about anything of value including Jewelry, gold, silver, rare and valuable coins and currency, tools, electronics, bicycles, cameras, video games, collectibles, antiques, guns, fishing equipment, sporting goods, golf clubs, musical instruments, radios, speakers, and anything else that has value to it. Over the last ten years our pawn professionals have helped thousands of customers throughout the Inland Empire and look forward to helping you. Call us at 909-627-9622 or visit our shop at 11031 Central Ave Ontario Ca and let one of our dedicated staff know exactly why you are looking for a pawn shop near you!